The enzyme industry has experienced significant growth during the last decade due to the global, growing demand for cleaner and greener technology to preserve the environment. Enzymes are complex protein molecules produced by living organisms. Enzyme technology uses isolated and purified enzymes as catalysts in various industrial processes. BCC Research reveals in a new study that because enzymes are biodegradable and cost-effective, enzymatic processes are quickly becoming better economic and ecological alternatives to chemical processes. Enzymes are being used in various industries due to their wide-ranging applications. Natural enzymes contain a limited number and type of reactive metal sites, which limits the potential of these enzymes to be used by industry. Enzymes that contain metal ions (that is, metalloenzymes) possess the reactivity of a transition metal center and the molecular evolution potential of enzymes. Previously, through molecular engineering, scientists expanded the scope of reactions catalyzed by naturally occurring metalloenzymes to include reactions not performed in nature. However, this strategy is limited by the reactivity of the metal centers in the native metalloenzymes. To overcome this limitation, scientists at Lawrence Berkeley National Laboratory and the University of California, Berkeley replaced the native iron of a metalloenzyme with the precious metal iridium, which behaves differently than iron. The result is artificial enzymes for abiological catalysis within the natural binding site of an enzyme that is suitable for evolution in the laboratory. The artificial enzymes provide reactivity for specific molecules with a high degree of selectivity and catalyze reactions not catalyzed by natural iron-enzymes or other metalloenzymes. A new analysis by BCC Research shows that the enzyme industry is a very lucrative market. The goal of players in the enzyme market is to design enhanced products and processes that not only are competitive, but that also meet the essential requirements of sustainability. Enzyme-based processes are gradually replacing chemical processes in many areas of industry. Enzymes provide advantages such as higher product quality, lower manufacturing cost, less waste, and reduced energy consumption. Key market drivers include new enzyme technologies, surging demand from the food industry and from producers of animal feed, and increased need for more renewable sources of energy such as cellulosic bioethanol. According to BCC Research, the global market for industrial enzymes is expected to grow from nearly $5.0 billion in 2016 to $6.3 billion in 2021, demonstrating a five-year compound annual growth rate (CAGR) of 4.7%. As a segment, food industrial enzymes should approach $1.5 billion and $1.9 billion in 2016 and 2021, respectively, growing at a five-year CAGR of 4.7%. 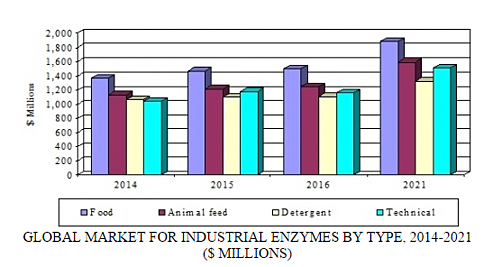 Animal feed industrial enzymes, as a segment, is forecast to total $1.2 billion and nearly $1.6 billion in 2016 and 2021, respectively, reflecting a five-year CAGR of 5.2%. This market segment is expected to rise due to higher investments in renewable sources of energy and increased demand for animal feed products. Population growth and a global need for cleaner and greener alternatives are also market drivers, further augmenting the demand for enzymes. Globalization and the increase in research and development within the enzyme market are also forces that are driving growth. Enzymes have revolutionized the research approach for various conditions. Enzymes have paved the way for a new class of drugs that allow for highly specific treatment, prevention, and control of many injuries and diseases. In addition, biotechnological advances have led to the replacement of harsh chemicals with biodegradable enzymes in various industrial processes. BCC Research’s study, Global Markets for Enzymes in Industrial Applications, analyzes industrial enzyme applications, with emphasis on technical enzymes and those used in the food and beverage industry. The report also discusses merger, acquisition, and collaboration strategies, as well as the competitive landscape and structure of the industry. Global market drivers and trends, with data from 2015, estimates for 2016, and projections of CAGRs through 2021, are provided.